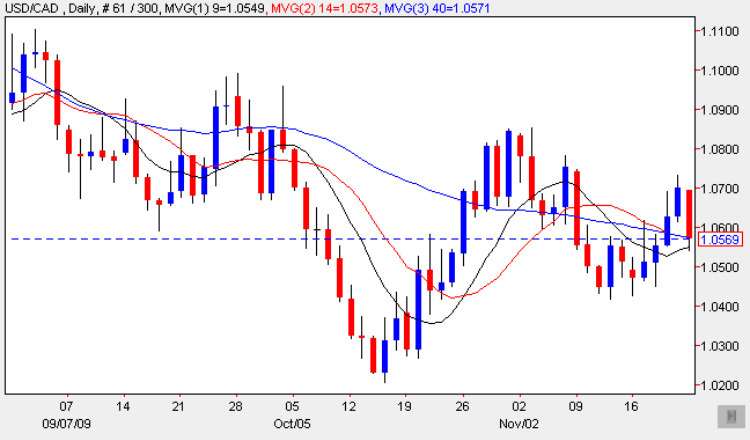 The bearish engulfing signal of yesterday was hardly an encouraging sign for usd/cad bulls, as the currency pair once again stalled after a minor recovery, ending the trading session with a wide spread down candle, and one which suggests that the recent modest bounce higher has already run out of steam. Whilst the bunched moving averages seemed to offer some support to the low of the day, due to the recent sideways price action, the weight we can give to these signals at present is significantly reduced as a result, and therefore this aspect of the chart can be ignored for the time being. The more important issue is the failure yesterday to penetrate the potential deep resistance area immediately ahead, which suggests that the mini rally is now over, and as a result we can expect the pair to continue lower once again. Below of course we now have two areas of potential support, firstly in the 1.04 region and should this fail then the more established and developed area at 1.02 may provide the springboard once again. Should this level fail to hold then parity awaits! With no items of fundamental news for Canada the markets will focus instead on the US where the two most important releases are the Premlinary GDP figures and CB Consumer Confidence data, either of which is likely to cause a reaction and giving us plenty of trading opportunities.